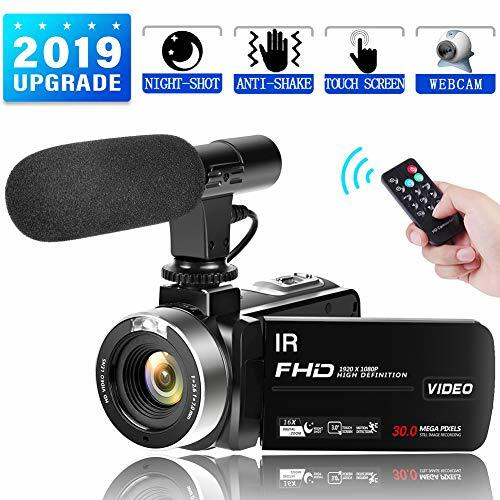 【1080P + 30MP + 16X zoom】The video camcorder captures clear video that 1080P HD resolution and 16X zoom (play on TV to get the best effect by connect with the HDMI cable). Capture wonderful photos in 30MP super high definition.This vlogging camera with the 3.0-inch ultra-clear touch screen, up to FHD_1920X1080 (30FPS) video resolution, and interpolated photo resolutions up to 30MP, which can be customized by you through the setting . 【IR Night Vision Camcorder+Support Up 128 GB SD Card】The digital camera is equipped with an infrared LED light for night vision shooting. You can easily turn this feature on by clicking the power button. When the light intensity is insufficient, press the right/infrared function button to turn on infrared night vision to get normal photos and videos. Card slots for SD card (max up to 128 GB, card NOT INCLUDED). 【Web Cam+Pause Recording Function】 This camera with flip screen supports webcam function, you can use the youtube camera camcorder live on YouTube.The pause function permit that you can start a suspended video without recording a new one, Equipped with a wireless remote control that controls zoom and shooting,no one will excluded in the group photo. 【Multi-function video camera for Youtube】This digital camcorder camera support external microphone,time-lapse recording/photography, motion detection, slow motion recording and continues shooting.The cheap camera also supports external UV lens or wide angel lens (external lens are NOT INCLUDED) to enable you to create wonderful recordings/pictures for filming youtube videos.External 1/4 inch, 6.35mm standard tripod, and the tripod should be purchased separately). 【Battery +Friendly after-sales service】This Digital Video Camera with microphone support one month free replacement or refund,one year warranty.If you have any questions, please feel free to contact our customer service team(click on the link, select the seller Linnse Tech Co., Ltd., and then send an email to us via ask a question) and we will give you a best solution within 24 hours.The flip screen camera use the NP 40 3.7V 1500mAh replaceable and rechargeable lithium battery.